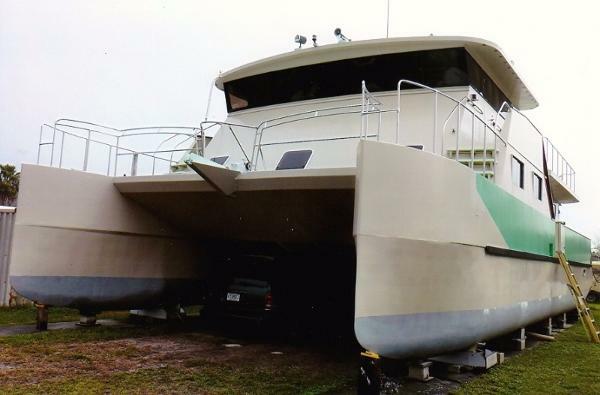 Please contact the owner directly @ 443-497-1278 or [email removed]om made fiberglass hull w/ V berth, galley and private head. 130hp Honda4 stroke w/low hours. Power T&T, dual stainless steel fuel tanks and reconditioned 3 axle trailer included. Built by Van Sant in Rockhall Md. and designed by Gill this is a unique vessel with a interesting history. Original drawings and newspaper articles, and photos about history are available. Must be seen to be appreciated. Bimini tops shown in photo is available but not installed, top may need some work. 1959 Phil Rhodes Bounty II Sloop 40'10" Builder: Aero Marine Plastics in Sausalito, California Hull# 22 Bounty II Sloop Rigging 7/8 Sloop Hull: full keel Length - LOA: 40'9" LWL: 28' 0? 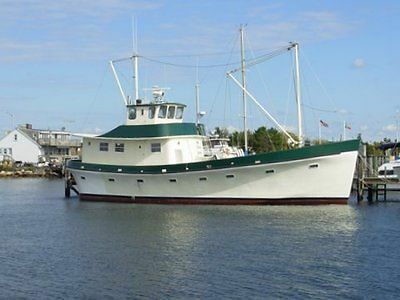 Beam: 10'3" Draft: 5'9" Material: fiberglass Displacement: 18800 Year: 1959 Cabins: 1 Berths: 4 Engine: 2QM 20 Yanmar Diesel engine; fresh-water cooled with low time Displacement 18,934 D/L Ratio 382.18 SA/D Ratio14.93 Capsize Screen 1.54 Waterline Area 192.96 PPI Imersion 1029.05 Comfort ratio 40.84 Sail Area 737 sq. 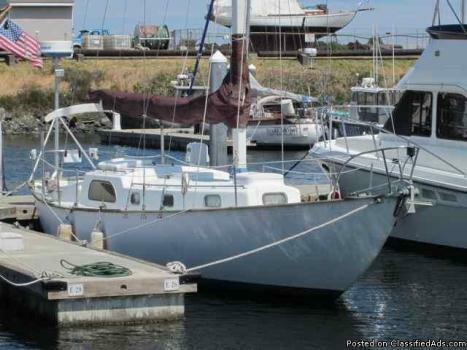 ft.; 7/8 rig This "Bounty II" built in 1959 is the ultimate ocean-going, sailing vessel from Aero Marine Plastics in Sausalito, California. The first production fiberglass sailboat of this size, 40 feet 10 inches long, hull #22, has a "bullet-proof" hull designed for ocean racing with classic lines by the famous naval architect, Phillip Rhodes. She raced off southern California in it's early days and has had only (3) owners. In the 80's & 90's "Stranger II" cruised the waters off Catalina Island while berthed in San Pedro, California. In the Pacific Northwest since 1995, "Stranger II" sailed the San Juans and local destinations while berthed in Port Angeles, Washington. Improvements to the hull, deck, rigging, engine, and interior: Customized interior with domestic & exotic woods: Ash, Teak, Puduk Double "V" berth Single or Double berth in salon Rewired with 12 vdc& 120 Ac Batteries: (2) 250 amp house; (1) starting battery Hart Interface: charger inverter New rudder - plywood/epoxy construction New pintels & gudgeons New tiller Replaced propeller & new shaft Refurbished Mast in 2013 with new LP paint Pressurized water AC waterheater Norcold Refrigerator AC/DC Extra gear included in the sale: Furuno Radar Furuno GPS Plotter Knotmeter Depth Sounder Skipper head with holding tank (bladder) Integral water tanks (2); 110 gallons total Integral fuel tank (1); 45 gallons Extra Sails & spinnaker/jib poles; mainsail & jib low time Anchors: (2) Dansforth (1) plow Cabin/Deck freshly painted ; topsides gelcoat Sunbrella interior cushions Bronze screens for ports& hatches Join the elite club of Bounty II owners with "Stranger II;" a proven sailing vessel of immeasurable beauty and one-of-a kind. 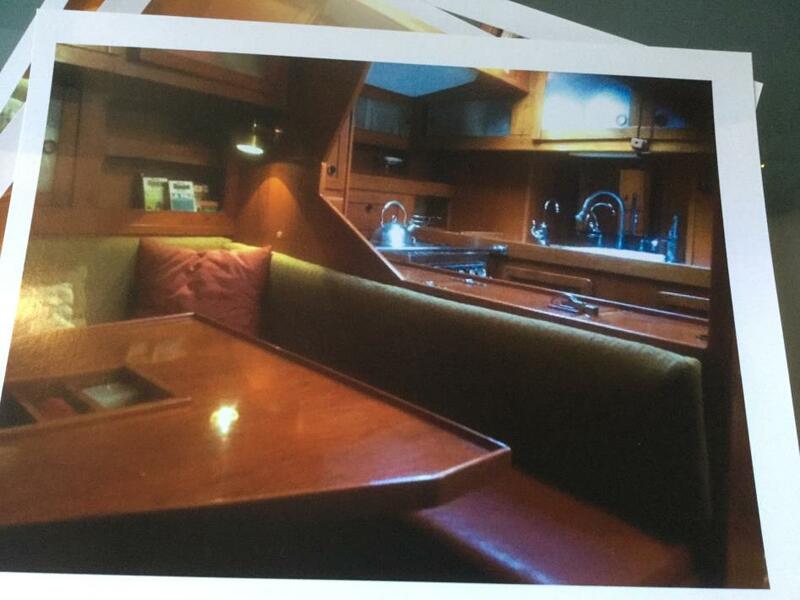 View the custom wood interior in the attached photos with wooden sink and burl wood veneered interior hatches. 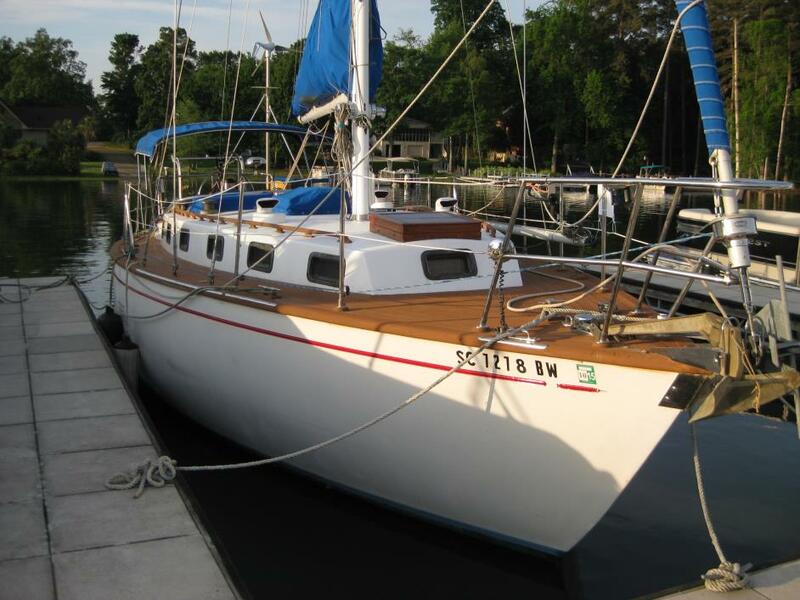 Asking $47,000 “Stranger II” is ready to take you on your sailing adventures. * Year:1987, late build with a number of 1988 features * Completely renovated in 2008 * Located in Brewerton, New York * Hull Material: Fiberglass * YW# 1750-1380785 * Engine/Fuel Type: Twin Detroit Diesels * Current Asking Price: US$198,000 Additional Specs, Equipment and Information: Builder: VikingDesigner: Bruce Wilson Dimensions: LOA: 44' Beam: 15' Displacement: 30 CRT (dry) Draft: 3 feet 10 inches 2 J&T Detroit Marine 6-71TI Diesel Engines with 450 HP each Hours: Slightly over true 830 hours on original factory Detroit Diesels Cruising Speed: 21 knotsMax Speed: 24 knots Tankage: Fuel: 460gal. Freshwater: 180gal. Hull lD#VKY44298E787 Place Built: New Gretna, New Jersey Documentation #931119 Hailing Port: Cleveland, Ohio Accommodations: Sleeps four comfortably in two private staterooms, each with its own full bathroom adjoining. The large dinette can be converted to sleep two additional guests, and the salon L-shaped sofa contains a hide-a-bed that can sleep two additional persons for a total of eight. Vessel is factory equipped with central air conditioning/heat. Heater is separate from A/C. The A/C is Marine Air reverse cycle type. Two additional factory installed heaters are built in, one in the salon and one in the master stateroom. Custom interior design throughout: G and L Interiors (Traditional Residential and Marine). This vessel was completely updated and is in immaculate condition throughout with no scratches, stains or surface defects. E-mail for details or visit the web site below: http://www.s487901756.onlinehome.us//Yacht/index.html Bridge: Up three steps from the aft deck is the bridge, the operational center of the vessel. It has a recently installed soft top with full strataglass enclosures with zippers that can be opened as is the case with the aft deck window material. There is an open, unobstructed view for both the captain and the passengers. The same beige/cream tweed carpet is contoured throughout the bridge area, including the stair treads leading up. There are twin padded full seats before the bridge panel, as well as padded surround seating to starboard and forward. Ample storage space can be found beneath these seats as well as within the teak cabinetry forward. Custom installed electronics and the quality Viking bridge gauges and controls are easily accessed by the captain. A newly installed Lowrance GPS/chart plotter and twin closed circuit television cameras have been added, the latter a convenience when there is a need to pilot the vessel stern first into or alongside a tight mooring. These cameras are located at the base of the radar arch, starboard and port. 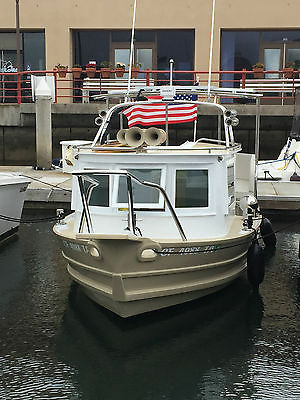 Additional electronics and bridge equipment include: * Furuno 24 mile radar * Robertson autopilot * lcom402VHF * Cybernet 2040 CTX VHF * Datamarine depth sounder * Datamarine knot indicator * Trim tabs * Fire extinguisher * Emergency engine shutoffs and fire protection system monitor at the helm * Bimini top with flybridge curtains * Additional fenders and lines * Life vests, all sizes, contained in zippered vinyl storage unit forward * Navigation lights * Pike poles, deck brushes and numerous other accessories inside teak storage cabinets forward * Original Viking tailored seat covers (two) at the helm Further electrical: * 30 & 50 electrical service * 30 amp power cord * 50 amp power cord with Glendinning cable master; both power outlets are located at starboard stern along with cable TV and phone connectors * 12V DC electrical system * 110V AC electrical system * Two 8D batteries replaced recently Deck: * Danforth anchor * Ideal windlass with chain and rode * Bow pulpit with rails * Four white fenders mounted in stainless steel holders * Lines Mechanical and Engine: Recent major engine check shows excellent compression and exacting maintenance standards. * Bilge blowers * Bridge controls * Engine Alarm * Emergency engine stop * Halon fire control system * Engine fuel shut off valve * Kohler generator, Diesel, 68.71 cu. inches * Alternator, 20 amps, 12 volts * Holding tank * Thermal acoustical insulation * Lube oil storage and transfer system * Hydraulic hynautic wheel steering * Bennett trim tabs * Walker air seps * Block heaters As can be seen from the photograph, these engines are in immaculate condition. Extensive documentation and maintenance records are available. Hull: This is a vessel constructed in the traditional era of a bygone day, superbly designed and made of heavy-duty fiberglass which makes her the ideal Great Lakes boat. She rides the waves stable and true. * Hull bottom and transom sealed with Interlux 2000 barrier coating * Interlux VC17M bottom paint * Hull washed annually before entering heated indoor storage Safety Features: * Ample quantity of life preservers. * Type IV throwable * Three wall-mounted fire extinguishers * Combination day/night VDS (flare gun) * Horn * Antique brass ship's bell, aft deck * Masthead light Additional information: * This vessel is in immaculate condition throughout with no scratches, stains or surface defects . 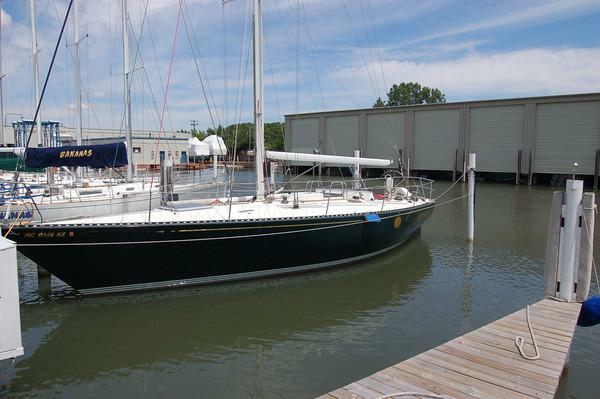 She is recommended for the serious buyer who wishes to own an exceptional, traditional Great Lakes yacht. We invite you to compare her with any other vessel of her type (double cabin cruiser) and vintage currently on the market. This Viking is one of a kind. Her barrier coat and paint are in excellent condition, along with her original gelcoat. She is stored in a heated indoor facility each winter. Even her headliners are as new. No detail has been overlooked. We welcome your requests for any additional information you desire. Reason for sale: declining health of devoted owners (husband and wife). * Numerous original maintenance records and documents are available, including all factory literature and manuals. * This boat has always been a freshwater vessel. Newly Installed Custom Teak Flooring: Steven Menz, Master Woodworker. Please note that the flooring is constructed of individually installed traditional teak planking and is not to be compared with sheet-applied or synthetic products. Each board was individually numbered so that the color and grain run true throughout. All hatches fit precisely, and the major hatches, where possible, are framed with contoured corners. Each hatch includes the appropriate traditional solid brass hardware. This endeavor was commissioned by the present owners in 2008 and required several months to execute while the vessel remained in enclosed storage for half of the boating season. (All wall-to-wall carpeting was removed, including that alongside the double berth in the forward stateroom which is paneled in teak, as well.) The original Viking inlay flooring, also in pristine condition, is retained in the galley and the heads only. The present owners retained these as well as the entirety of the superb Viking teak joinery throughout the boat. Aft Deck: From the salon up two steps and through twin teak glass-fronted doors, the large aft deck is equipped with the original factory installed fiberglass hardtop and strataglass windows that can be unzipped and fastened upwards to provide ventilation if needed. There is a door to both starboard and port for easy access to the deck areas. The floor is original textured fiberglass with a new custom contoured beige/cream tweed carpet. In addition, the room contains the original Viking teak cabinetry behind which a complete wet bar with a sink and an icemaker/refrigerator can be found. There is also a door at the stern providing access to a teak stairway leading to the teak swim platform. The surrounding railings are also solid teak. The furniture consists of an upholstered loveseat and chair, an additional lounge chair with a coffee table to match. The upholstery is of a beige and mocha "sunbrella" fabric which is resistant to fading. The present owners have also included protective contoured coverings for all upholstered pieces to further protect the upholstery when the vessel is in storage or left unattended for a period of time. Also present are two teak side tables located to port. Custom made tan canvas runners are included for the aft deck and the salon in order to protect both the salon and aft deck carpets during viewing purposes and the flooring surfaces when workmen are engaged to provide services within the vessel. Decorative pillows also accent the aft deck furniture making this a most comfortable area in which to relax and enjoy a panoramic view of the scenery, rain or shine. Master Stateroom: The master stateroom is located three steps (teak) down aft. This room contains a center-line queen berth with generous space to move freely throughout the areas therein. There is extremely ample drawer and cabinet storage space throughout, including a full-sized clothes closet and separate locker. Three lamps provide excellent illumination, including a "his-and-hers" three-way lamp on either side of the bed for nighttime reading. The contoured bedspread is embroidered linen and includes decorative silk pillows. The window treatments to starboard and port, also including the large transom window, are embroidered silk organza overlaying English chintz, also lined and interlined. A matching drapery is also present on the window inside the full-length locker to starboard. The flooring throughout is teak. All additional Viking woodwork/cabinetry has also been retained in this room. The room also contains a fire extinguisher as per regulations. Master Head Aft: This head is located to port, and as per the guest head, contains a full bath with vanity, stall shower, mirrors, ample lighting and electric commode. The original Viking ivory-toned inlay flooring has been retained throughout. The window treatment is made of English silk organza with hand-applied antique lace trim surround. There is generous teak cabinetry providing storage space both above the vanity and below. Guest Stateroom Forward: This private stateroom features a double bed, generous drawer and locker storage and an opening hatch overhead. The draperies starboard and port are 100% silk dupioni, fully lined and interlined for longevity and aesthetic appeal. These include a complimentary trim along each perimeter. The custom contoured bedspread is fabricated of English chintz. Silk decorative pillows enhance the decor. (Unfortunately, these are not visible in the photograph below.) Unlike many forward staterooms, this room is amply lighted, including a reading lamp at the head of the bed, and it contains additional decorative accents. The room contains a genuine Persian rug. All woodwork throughout, including flooring, is solid teak. Guest Head Forward: The spacious head to port adjoins the guest stateroom and is accessible from the stateroom itself and the hallway as well. The doors can be closed to afford maximum privacy for your guests. The room is generously lit with a large vanity, sink, electric commode and a stall shower. The window curtain is silk with an antique lace border, lined and interlined. There is an ample mirrored medicine/storage cabinet above the sink as well as teak storage cabinetry beneath. The flooring is the original Viking ivory-toned inlay with no imperfections. Laundry Area: Located in the hallway to starboard are the Kenmore washer and dryer. The present owners can attest to the fact that the washer was never used as the original drum restraint strips used for transport from the factory were never removed. This was discovered and the strips were subsequently extracted shortly after the purchase of the yacht upon instruction by the present owners, and both appliances function perfectly. Neither has been used since the test run by the Kenmore sales representative who performed this work. Therefore, they remain in as new condition. There is a convenient rod above for use in hanging clothing. These appliances are concealed from view by a paneled teak door and attractive surrounding teak moldings. The hallway flooring is also teak. Galley: This vessel is a galley down style. It is located opposite the dinette to starboard and has a custom teak-paneled Kenmore refrigerator and freezer which matches the original Viking cabinetry style and was commissioned by the present owners. Solid brass safety latches hold both doors in place should the vessel be underway in rough seas. The galley contains a stainless steel sink with garbage disposer, instant hot water, a three-burner electric range, a microwave-convection oven, a disposal, water heater and fresh water system. There is ample storage above, below and alongside the countertops. A central vacuum system is also included. There is also a fire extinguisher in this room as per regulations. The flooring is the original ivory-toned Viking inlay material. Numerous kitchen utensils and other decorative accents are included with the purchase of the vessel. Dinette: Opposite the galley to port is the dinette area with ample seating for six adults. The teak table can be lowered and the dinette converts to a two-sleeper bed. The U-shaped surround seating is custom upholstered around the large table. Complimentary decorative pillows add to the comfort and aesthetic appeal. The window treatment is of a harmonious silk textile, and the area is extremely well lit. There is commodious storage space present beneath the seating area. The flooring and surrounding surfaces in the dinette are teak with a genuine (not a knockoff) Persian carpet located to the front of the table. All areas and accessories are in as new condition. Salon: Up two stairs (teak), the large salon offers ample seating with custom upholstered L-shaped sofas (one containing the hide-a-bed) to port with a French desk and chair to starboard. This makes a fine computer desk as well as a writing area as the desktop lifts for storage of papers, pencils and other related items. There is a wet bar also located to starboard. Numerous compatible silk decorative pillows arranged upon the sofas are included. As is throughout the vessel, all textiles are new. The salon also has immaculate teak joinery, teak flooring throughout and generous storage space. The original Viking Sony color television is contained in its own enclosed teak cabinet as per factory. A Sony audio system, also factory original, can be played throughout the vessel. Two lamps enhance the decor. (Please note: The designers are well versed in marine applications, and every permanent decorative or accent piece has been firmly secured in order to prevent accidents while underway. Personal items such as family photographs, candlesticks and the like must, of course, be stowed beforehand.) The ceiling lighting is of the traditional yacht design with color-compatible wooden bezels surrounding each fixture. A genuine Persian carpet (sale negotiable) enhances the overall decor. Should the future buyer(s) desire a substitute of similar quality, the interior designers have access to such and would be pleased to present artistically appropriate options in a variety of sizes at no additional cost. There is an ebony English tray table in the eighteenth century style located in front of the sofas. The draperies are of an ivory tone, and the large windows to starboard and port are equipped with Magna-Vue blinds. These blinds, when open, permit much more light and views of scenery to enter the room and were installed by the interior designers at the request of the present owners who wished to eliminate the "closed in" feeling of the original conventional mini blinds. 1977 Bruce Roberts Custom World Class Cruiser "Libre" represents a rare opportunity to own an exquisite world class cruising yacht. Her fiberglass hull was laid up in 1977, 42% heavier than her original design specifications. Almost 6 years later and nearly 1000 board feet of teak consumed, "Libre" went for her first sail. Every single detail was thoroughly thought out and meticulously completed with the finest materials available. Her interior is second to none. Constant upgrades have been made by her extremely knowledgeable owners, throughout her life and a major refit was completed in the galley area in 2002. As you will read below, she differs a great deal from her original plans, but she is the safe, strong, high performance world cruiser Bruce Roberts intended her to be and more. Redundancy was a major design consideration throughout her build. 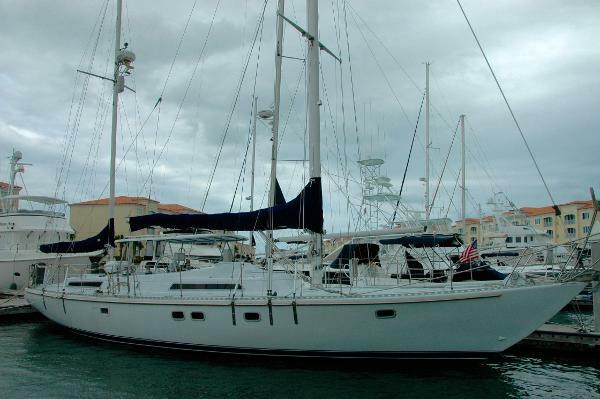 While she is not for everyone, she is the perfect choice for a cruising couple with live aboard and/or voyaging plans. Come take a look, you will be amazed by this vessel. 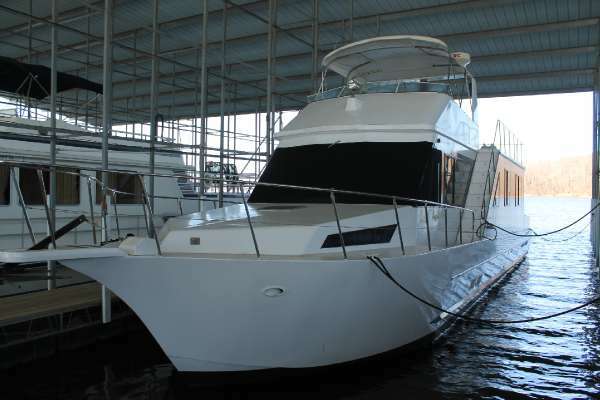 2014 Waterway Cruiser A custom designed yacht built specifically for inland waterway or coastal cruising. The long narrow fiberglass pontoons require very little power to operate at normal waterway trawler speeds of 7 to 8 knots. Powered with twin Cummins diesels and state-of-the-art technology pod drives. Planned for a combination of roomy comfort and fuel efficiency. USCG documented at 116 gross tons therefore can legally carry up to 12 passengers for hire. This vessel would also make a great liveaboard or guesthouse for a waterfront property owner. 1979 C & C Custom This C & C is a Custom Division built sailboat and features a sloop racing rig with a large aft cockpit. The hull and deck are fiberglass with a balsa wood core for light weight and insulating qualities. This was considered a high performance racer at the time it was designed and built in 1979. Kintama has been extremely well cared for by a very knowledgeable, seasoned sailor. 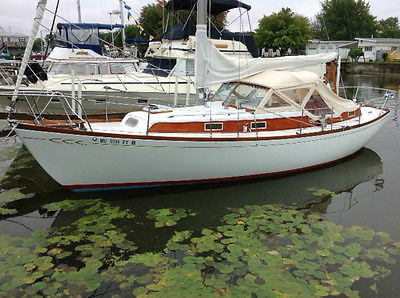 She is a fresh water boat that came from Buffalo, NY and then the Chicago area - previously known as Schedar. The PERF rating is 72. There have been many recent upgrades in electronics and rigging. Kintama would make a great racer/cruiser for the performance-minded sailor and she has a very beautiful teak interior for the cruising minded. She can be seen by appointment only, as she is in the Detroit area.